The anti-apartheid leader and Nobel laureate was a beloved figure around the world, a symbol of reconciliation from a country with a brutal history of racism. Mandela was released from prison in 1990 after nearly 30 years for plotting to overthrow South Africa’s apartheid government. In 1994, in a historic election, he became the nation’s first black leader. Mandela stepped down in 1999 after a single term and retired from political and public life. Born Nelson Rolihlahla Mandela in Transkei, South Africa, on July 18, 1918, he was one of the world’s most revered statesmen and revolutionaries who led the struggle against apartheid in South Africa. A qualified lawyer from the University College of Fort Hare and the University of Witwatersrand, Mandela served as the president of South Africa from 1994 to 1999. His political career started in 1944 when he joined the African National Congress (ANC), and he participated in the resistance against the then government¹s apartheid policy in 1948. In June 1961, the ANC executive approved his idea of using violent tactics and encouraged members who wished to involve themselves in Mandela’s campaign. Shortly after, he founded Umkhonto we Sizwe, the armed wing of the ANC, and was named its leader. In 1962, he was arrested and convicted of sabotage and other charges, and was sentenced to five years of rigorous imprisonment. In 1963, Mandela was brought to stand trial along with many fellow members of Umkhonto we Sizwe for conspiring against the government and plotting to overthrow it by the use of violence. On June 12, 1964, eight of the accused, including Mandela, were sentenced to life imprisonment. Mandela served 27 years in prison, spending many of those years at Robben Island Prison, off Cape Town. While in jail, his reputation grew and he became widely known across the world as the most significant black leader in South Africa. He became a prominent symbol of resistance as the anti-apartheid movement gained momentum in South Africa and across the world. On the island, he and other prisoners were subjected to hard labor in a lime quarry. Racial discrimination was rampant, and prisoners were segregated by race with the black prisoners receiving the fewest rations. Mandela has written about how he was allowed one visitor and one letter every six months. In February 1985, President P.W. Botha offered Mandela his freedom on condition that he unconditionally reject violence as a political weapon, but Mandela rejected the proposal. He made his sentiment known through a letter he released via his daughter. “What freedom am I being offered while the organization of the people remains banned? Only free men can negotiate. A prisoner cannot enter into contracts,” he wrote. In 1988, Mandela was moved to Victor Verster Prison and would remain there until his release. Throughout his imprisonment, pressure mounted on the South African government to release him. The slogan “Free Nelson Mandela” became the new battle cry of the anti-apartheid campaigners. Finally, Mandela was released on Feb. 11, 1990, in an event streamed live across the world. After his release, Mandela returned to his life’s work, striving to attain the goals he and others had set out almost four decades earlier. In 1991, the first national conference of the ANC was held inside South Africa since the organization had been banned in 1960. Mandela was elected president of the ANC, while his friend Oliver Tambo became the organization’s national chairperson. 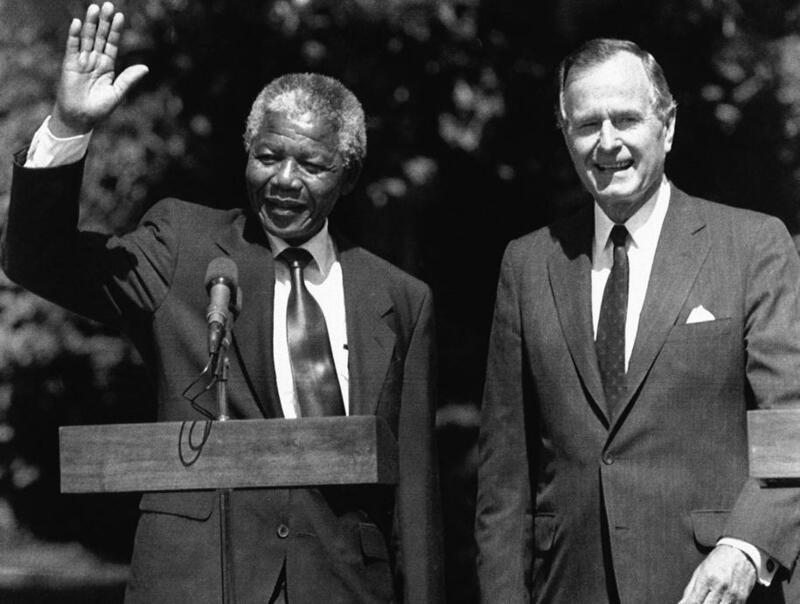 Mandela’s leadership and his work, as well as his relationship with then President F.W. de Klerk, were recognized when they were jointly awarded the Nobel Peace Prize in 1993. South Africa’s first multiracial elections, held on April 27, 1994, saw the ANC storm in with a majority of 62 percent of the votes, and Mandela was inaugurated in May 1994 as the country’s first black president. In 1990, he received the Bharat Ratna Award from the government of India and also received the last ever Lenin Peace Prize from the Soviet Union. Mandela received many national international honors, including the Nobel Peace Prize in 1993, the Order of Merit from Queen Elizabeth II and the Presidential Medal of Freedom from George W. Bush. In July 2004, the city of Johannesburg bestowed its highest honor by granting Mandela the freedom of the city at a ceremony in Orlando, Soweto. In 1992, he was awarded the Ataturk Peace Award by Turkey. He refused the award citing human rights violations committed by Turkey at the time, but later accepted the award in 1999. Also in 1992, he received the Nishan-e-Pakistan, the highest civil service award of Pakistan. Mandela’s autobiography, “Long Walk to Freedom,” was published in 1994. He had begun work on it secretly while in prison. Nelson Mandela’s love life has seemingly run parallel to his political one — and can be divided up into three key eras. The young activist married his first wife, Evelyn Mase, in 1944. The couple, who had four children, divorced in 1958 — shortly before Mandela became an outlaw with the banning of the ANC. Mandela’s second marriage — and probably his most famous — largely coincided with the time he spent locked up at the hands of the apartheid regime. In 1958 he walked down the aisle with Winnie Madikizela, who stood by his side and actively campaigned to free him from prison. Winnie became a powerful figure in her own right while Mandela was imprisoned, but a series of scandals involving her led to the couple’s estrangement in 1992, her dismissal from his cabinet in 1995, and their official divorce in 1996. The couple had two children. Winnie Mandela was also later convicted of kidnapping. His third marriage, to Graca Machel — the widow of former Mozambique President Samora Machel — came on his 80th birthday as he entered his role of world statesman. Yahoo Australia contributed to this report. [TRANS] 130726 Even Though JYJ Won, Korean Entertainment Agencies Won’t Change… Why? In the first model of Korean entertainment agencies, one person had full authority as the CEO of the company. In fact, there was no division between managers and CEOs. This model still makes up the majority of entertainment agencies in Korea. But large-scale agencies have begun to move away from this point. Agencies such as Sidus and SM prefer a method of division and specialization rather than such a vertical relationship. But this doesn’t mean that the decision process is perfectly horizontal and equally divided. Unlike the US, Korea’s entertainment agencies have a strong sense of possession rather than acting as an agent. Ten years ago, when singers stood on stage at various awards ceremonies, the media was flooded with images of them crying and thanking their agencies’ CEOs. But these crying singers who expressed their gratitude have disappeared. Why did they cry and thank the CEOs then, and why have they disappeared now? The singers couldn’t help but be thankful as these people were responsible for providing them with transport and housing, as well as allowing them to release album and appear on television programs, taking them to up to stardom. Were these agencies’ CEOs social philanthropists for providing an unlimited investment for these strangers and helping them attain fame and fortune? But these grateful youths soon found out why these people had invested so much to train them. The act of discovering them, training them and helping them make their debut as stars was not an act of philanthropy, but for pure profit-making purposes. In the early 90s, SM had already invested over 3 billion Won in the debut of BoA, who was a fifth grader at the time. Of course, one can question if all that money really did go into helping her, but the bottom line is, they invested so much to the point that they were in debt. The Samsung Economic Research Institute (SERI) claims that BoA’s current value can be estimated at around 1 trillion Won. During an interview, CEO Lee Soo Man of SM stated, “The budget for that project was 3 billion Won. But our company didn’t have 3 billion Won and had to borrow money. If I look back on what we did, I find it crazy that we did that, but it was something I really wanted to push forward.” According to data, other entertainment agencies invest around 2~3 billion Won for 4 to 5 years before and during their respective idol groups’ debut. At least 400~500 million Won is invested in each person. Though it may be difficult to accept this value as it is the one that entertainment agencies release to the public, it is undeniable that a large sum of money is put into each person. The larger and more specialized an agency, the more money that is invested. Their motivation behind putting themselves in debt and getting monetary investments to feed and clothe singers, and give them a chance to perform, is nothing but to collect profits. The moment when astronomical amounts of profits start coming in is also the moment when the gratitude turns to resentment. Celebrities who are trained through various investments are considered the agencies’ assets. They cannot make the decision to move on by themselves. Because that is when they become disloyal beasts who bite the hand that feeds them. Slave contracts are just one of the risk hedges that agencies take on. In the case that singers don’t become popular even though a lot of money and resources have gone into their careers, or if too much money has had to be used, agencies have to be able to extract that profit from them without them moving somewhere else. The reason why an unlawful slave contract exists, even when the profits are high, is because of a strong sense of possession that agencies have. The concept of ‘Because I made you what you are’ is very predominant. This Korean reality can be seen in the possessive obsession that parents have on their children. Jang Yoon Jung’s disputes with her family is a clear example of this. If such obsession occurs in a family to such a degree, it must be worse in entertainment agencies. You can earn between 100 billion to 1 trillion Won if your initial billion-Won investment in an idol goes well. This is the reason why they put themselves into debt, and push debt onto others. Because once a star rises, they bring in an exponential amount of profit. This strengthens the agencies need to bring in more for themselves. The stronger the belief that these singers are the products and possessions that the agencies created, the more unlawful the contracts become, at least, for the members in these idol groups. In July of 2009, JYJ claimed that their exclusive contract with SM was unlawful and filed an exclusive contract nullification injunction. The contract period was 13 years, too long to be fair, and the income distribution favored the company too much. When JYJ left TVXQ, the Korean Federation of Pop Culture and Arts Industries (KFPCAI), which SM is affiliated with, sent an official notice to broadcasting companies and ordered them to not allow JYJ to appear on their shows. Pushed by the wish of the agency, the broadcasting companies accepted this request and didn’t allow JYJ to appear on their shows. 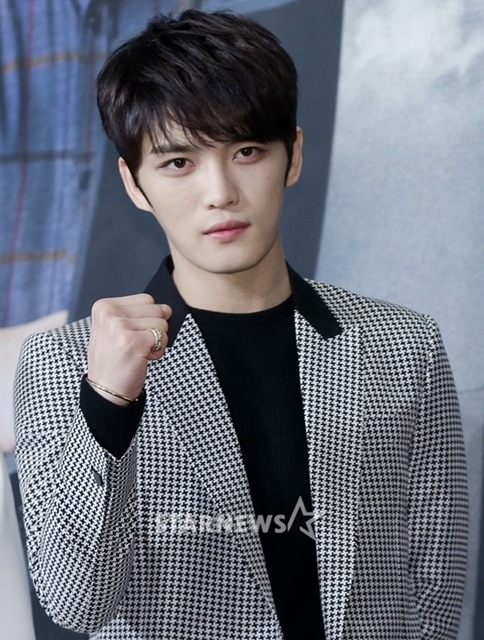 JYJ were even stopped from airing their documentary and chased away from showing it in cinemas. They were unable to approach the public through the media. 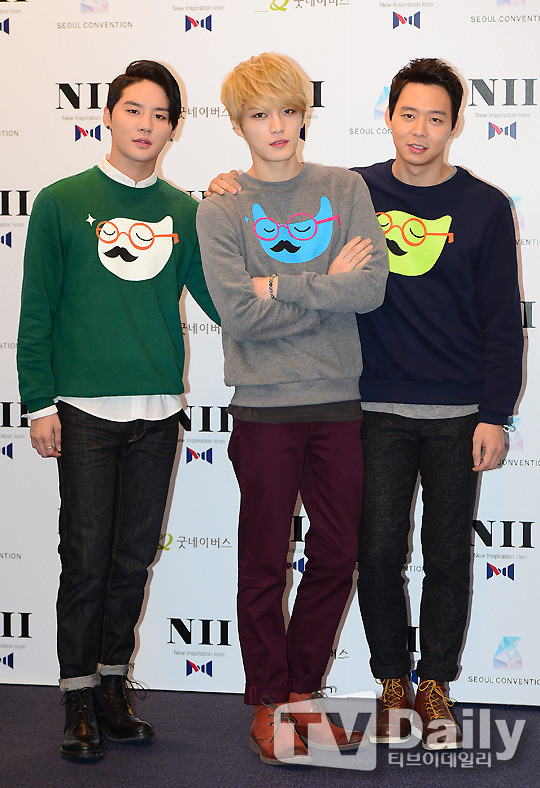 Although the KFPCAI’s influence reached the album and online music file distribution companies as well, JYJ sold over 300,000 copies of their first album. The reason why such an amazing feat could take place was because of JYJ’s domestic and international fans. The Fair Trade Commission (FTC) came to a verdict that found SM and the KFPCAI guilty of interfering with JYJ’s album distribution and broadcasted television appearances, and this was thanks to the active participation of JYJ’s fans. Paradoxically, these groups of fans are formed through the resources and marketing of large-scale agencies. If they had not laid down a sturdy foundation, singers would not have been able to attract fans both domestically and overseas. This is the point that entertainment agencies drive home. On the other hand, agencies are not needed to create idols anymore like before. This is because the product rotation cycle in idol stardom has gotten very short. The US agency system invests less energy in the training of talent. They have a model that takes people who are already on their way to becoming singers, and increasing their value to collect their profit. They are not of the mindset to start from scratch and perfect the package like Korea is. We cannot say which is right and which is wrong, but thinking of people as mere products and restricting them from gaining their own independence for the sake of profit is not an act of fair business transactions, but a violation of human rights. Therefore, JYJ’s current predicament makes one wonder if Korea will be able to transition into the US agency model. However, the reason why the Korean model was able to create the Hallyu Wave is not because of this agency mentality, but because of a business asset mentality. The possession mentality has overpowered a sense of being the connector or representative. A collective production process has its own pros and cons. It works in some markets but doesn’t work in others. If it stops working in the markets it used to flourish in, and is unable to expand into new markets, the Hallyu Wave will meet the same fate as Hong Kong movies. If profits don’t match expectations, regardless of the large sums of money invested into projects, and standard contracts are obeyed, investment capital will actually decrease. We will have to wait and see if any broker-like agency models will arise in the 21st century that connect independent contents rather than producing and creating their own music. But this will only be possible if more opportunities are given to talented people to stand in front of the public and show off what they’ve got. Only then will independent contents, bolstered by each individual’s unique characteristics, be created. Without such a thing, the tragedy of not being able to reach the public without getting along with certain people will perpetuate, creating even more inequality. Creative contents cannot be created in such an environment. “Let go of your obsession with your children. They are not your property.” Excessive affection and involvement will become a thing of the past. Loyalty and faith, gratitude and repayment will disappear as an outdated mentality. SEOUL, South Korea — North Korea warned Seoul on Saturday that the Korean Peninsula had entered “a state of war” and threatened to shut down a border factory complex that’s the last major symbol of inter-Korean cooperation. Analysts say a full-scale conflict is extremely unlikely, noting that the Korean Peninsula has remained in a technical state of war for 60 years. But the North’s continued threats toward Seoul and Washington, including a vow to launch a nuclear strike, have raised worries that a misjudgment between the sides could lead to a clash. North Korea’s threats are seen as efforts to provoke the new government in Seoul, led by President Park Geun-hye, to change its policies toward Pyongyang, and to win diplomatic talks with Washington that could get it more aid. North Korea’s moves are also seen as ways to build domestic unity as young leader Kim Jong Un strengthens his military credentials. Hours after the statement, Pyongyang threatened to shut down the jointly run Kaesong industrial park, expressing anger over media reports suggesting the complex remained open because it was a source of hard currency for the impoverished North.”If the puppet group seeks to tarnish the image of the DPRK even a bit, while speaking of the zone whose operation has been barely maintained, we will shut down the zone without mercy,” an identified spokesman for the North’s office controlling Kaesong said in comments carried by KCNA. South Korea’s Unification Ministry responded by calling the North Korean threat “unhelpful” to the countries’ already frayed relations and vowed to ensure the safety of hundreds of South Korean managers who cross the border to their jobs in Kaesong. It did not elaborate. South Korean Defense Ministry spokesman Kim Min-seok said the country’s military remains mindful of the possibility that increasing North Korean drills near the border could lead to an actual provocation. “The series of North Korean threats – announcing all-out war, scrapping the cease-fire agreement and the non-aggression agreement between the South and the North, cutting the military hotline, entering into combat posture No. 1 and entering a `state of war’ – are unacceptable and harm the peace and stability of the Korean Peninsula,” Kim said. “We are maintaining full military readiness in order to protect our people’s lives and security,” he told reporters Saturday. The White House has stressed the U.S. government’s capability and willingness to defend itself and its allies and interests in the region, if necessary. “We remain fully prepared and capable of defending and protecting the United States and our allies,” Hayden said. Dozens of South Korean firms run factories in the border town of Kaesong. Using North Korea’s cheap, efficient labor, the Kaesong complex produced $470 million worth of goods last year. BEIJING — U.S. and Chinese leaders said Saturday that their countries are committed to finding a peaceful way to ensure a nuclear-free Korean peninsula. “We are determined to make that goal a reality,” U.S. Secretary of State John Kerry said after talks with Chinese officials and before having dinner with China’s foreign policy chief, Yang Jiechi. “China and the United States must together take steps in order to achieve the goal of a denuclearized Korean peninsula. And today we agreed that further discussions to bear down very quickly with great specificity on exactly how we will accomplish this goal,” America’s top diplomat told reporters. 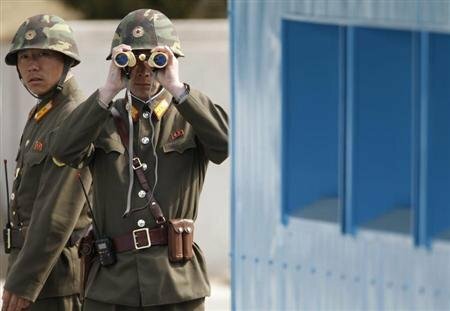 SEOUL (Reuters) – North Korea intensified threats of an imminent conflict against the United States and the South on Tuesday, warning foreigners to evacuate South Korea to avoid being dragged into a “merciless, sacred, retaliatory war”. The North’s latest antagonistic message belied an atmosphere free of anxiety in the South Korean capital, where the city center was bustling with traffic and offices operated normally. Pyongyang has shown no sign of preparing its 1.2 million-strong army for war, indicating the threat could be partly intended to bolster Kim Jong-un, 30, the third in his family to lead the reclusive country. None of the embassies in Seoul appeared to have issued any directives to their nationals after the warning and airlines reported no changes in their schedules. Schools catering to foreign pupils worked without interruption. The warning, read out on North Korea’s state television in a bulletin that interrupted normal programming, was the latest threat in weeks of high tension following U.N. sanctions slapped on Pyongyang for its latest nuclear arms test. It followed the North’s suspension of activity at the Kaesong joint industrial park just inside North Korea, all but closing down the last remnant of cooperation between the neighbors. North Korean workers failed to turn up on Tuesday. North Korea had said South Korea was trying to turn the Kaesong complex into a “hotbed of war”. The warning to foreigners, reported by the KCNA news agency said once war broke out “it will be an all-out war, a merciless, sacred, retaliatory war to be waged by (North Korea). “It does not want to see foreigners in South Korea fall victim to the war,” the agency quoted the Korea Asia-Pacific Peace Committee as saying. Last week, North Korean authorities advised embassies in Pyongyang to consider pulling out in case of war, though none appeared to have taken any such action. Speculation has grown that the North would launch some sort of provocative action this week — perhaps a missile launch or a fresh nuclear weapons test. “Technically, they can launch it as early as tomorrow,” the source said. A Philippine foreign ministry spokesman quoted diplomats at its Seoul embassy as saying the situation “remains normal and calm”. Stocks, which had fallen 4 percent over the past four days, edged higher on Tuesday despite the warning to foreigners. The won currency moved little, dipping slightly after the North Korean statement. Employers at the Kaesong complex faced uncertainty as the 53,000-strong North Korean workforce stayed away. A spokesman for textile company Taekwang Industrial and at least two other firms said production had stopped. About 475 South Korean workers and factory managers remain in Kaesong, which generates $2 billion in trade for the impoverished North. The Seoul government said 77 would return on Tuesday. North Korean workers at the park have appeared increasingly agitated in recent days, refusing to talk to their colleagues. Many Southerners connected with the park bedded down at budget hotels in a nearby South Korean town in the hope that an order would come from the North to re-open. “I have been feeling anxious now and then. Now it’s really preposterous facing this,” said Shing Dong-chul, 55, a South Korean worker who transports wire made in Kaesong. Addressing a cabinet meeting, South Korean President Park Geun-hye described the suspension of Kaesong as “very disappointing” and said investors would now shun the North. Few experts had expected Pyongyang to jeopardize Kaesong, which employs more than 50,000 North Koreans making household goods for 123 South Korean firms. The zone is practically the last vestige of the “Sunshine Policy” of rapprochement between the two Koreas and a powerful symbol that the divided country could one day reunify. South Korean companies are estimated to have invested around $500 million in the park since 2004. World leaders have expressed alarm at the crisis and the prospect of a conflict involving a country claiming to be developing nuclear weapons. China, the North’s sole diplomatic and financial ally, issued a new call for calm and restraint, though Beijing’s leaders have shown increasing impatience with Pyongyang. “We ask all the relevant sides to bear in mind regional peace and stability and earnestly protect the legal rights and safety of citizens,” Chinese Foreign Ministry spokesman Hong Lei told a briefing. A Russian foreign ministry spokesman, in a statement on the ministry’s website, said Moscow was in solidarity with all G8 industrialized countries “as regards the rejection of Pyongyang’s current provocative and bellicose line of conduct”. The North is also angry at weeks of joint U.S.-South Korean military exercises off the coast of the peninsula, with B-2 stealth bombers dispatched from their U.S. bases. But the United States announced the postponement last weekend of a long-planned missile launch, a move officials said was aimed at easing tensions on the peninsula. U.S. Secretary of State John Kerry visits Seoul this week and the North holds celebrations, and possibly military demonstrations, next Monday to mark the birth date of its founder, Kim Il-Sung – the current leader’s grandfather. In Washington, U.S. Deputy Defense Secretary Ashton Carter urged China to use its influence with the North and said Moscow wanted similar action from Beijing. But Chinese criticism of North Korea is unlikely to mean tough new action against Pyongyang because China would see any collapse of its troublesome neighbor as a disaster. YAPHANK, N.Y.—It’s Saturday on Long Island, and no business is open while city employees are busy clearing snow off the roads. Although I was surprised how quickly snow covered my car on Friday, it is unbelievable today. My car is completely covered in snow. In front of my house, there is nowhere to pass. Worst of all, I lost power last night. The snowstorm has caused many of my neighbors to stay home. My neighbors usually wake up early in the morning. As I’m writing, it is 9:43 a.m., but I can’t see anyone outside. The temperature is going down, and it is very windy. 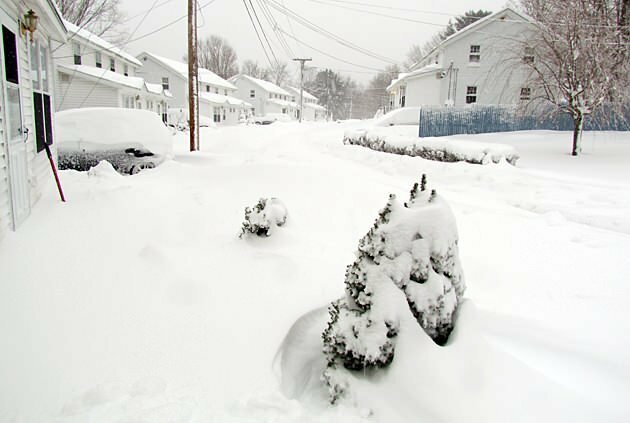 NORWICH, Conn.—This morning we are still experiencing heavy snowfall, though forecasters expect that to taper off around 10 a.m. Norwich has about 23 inches of snow at the moment. Snow banks in our front yard have easily reached waist-high. We had to shovel the snow outside our front door twice in the middle of the night just to prevent us from becoming trapped inside. A blanket of about three inches of snow covers all the roads to our neighborhood; it’s clear that the plows have not come through for some time. The storm became so bad last night that state and city plow trucks were pulled off the roads; they are now back in action. Not only is traveling impractical, but it’s also impossible. Even so, Gov. 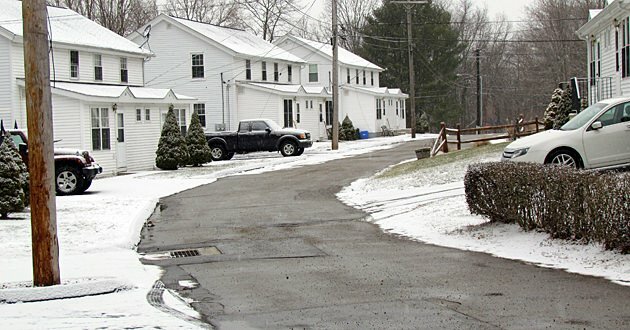 Dan Malloy ordered that all roads be closed until further notice to prevent optimistic drivers from getting stuck in the snow. Though Connecticut Light & Power reports about 36,000 of its customers without power, here in Norwich, the Norwich Public Utilities is only reporting sporadic outages, with about 160 customers out of power. We thankfully experienced no power outages during the storm. PORTLAND, Maine—It’s 8 a.m. Saturday, and we’re going absolutely nowhere. Snow is still falling and the plows have yet to be seen on my little street. The snow from Nemo has buried the entire street, and cars are barely visible under the snow drifts. 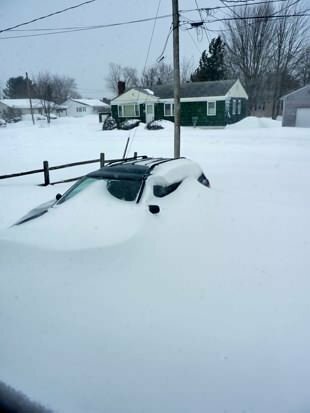 There may be a small car or two that have completely disappeared. I’ve lived in Maine my whole life, and we’re used to heavy snow; this, however, is one of those storms we will remember digging out from. Light fluffy snow is pretty, but it drifts a lot and with the wind from this storm, it has piled up in front of doors and cars. As soon as you dig out, it starts filling back in. No one here is going anywhere for a while. CHELSEA, Mass.—Snow covers all of my windows. The only sounds my companion and I hear are the wind whipping outside and the occasional rumble of a plow or wail of a fire engine siren. Gov. Deval Patrick ordered all non-emergency vehicles off the road after 4 p.m., the first time that’s happened since the infamous Blizzard of ’78, so the roads are virtually empty. We spotted a swerving SUV attempting to brave the storm this evening, but the storm was clearly winning. Everything is closed, even the 24-hour McDonald’s just down the street that never closes. There’s nowhere to go, and no logical way to get there, so there’s nothing much to do but wait out the storm. My companion and I — along with most of Chelsea and the surrounding towns, apparently — did all of our grocery shopping Thursday night, so we’re well-stocked with food and making the best of a nice, (mostly) quiet Friday at home. We’ve been going outside every hour to take pictures and measure accumulation; the snow is falling at about two and a half inches an hour now. The conditions are ghastly, but in a sense they’re also magical. My mother was pregnant with me during the Blizzard of ’78, so this is the first storm of this magnitude I’ve experienced firsthand, and it brings with it a sense of childlike excitement. Even my cat has been peering out the window in wonder, trying to figure out what’s going on. We’re keeping our fingers crossed that we don’t lose power, and that when we wake up Saturday, my car won’t be completely buried beneath the snow. But whatever the outcome, this blizzard a great excuse to spend a cozy evening with a loved one and appreciate the shelter from the storm. BRONX, N.Y.—As winter storm Nemo approached my Bronx home, memories of Sandy were still fresh in New Yorkers’ minds. We’ve learned to take the weather seriously. After monitoring the weather reports, I made the decision to handle all my business, including grocery shopping, one day before the storm. Snow in NYC not only screws up the roads, it also disrupts train service. And sure enough, service has been disrupted. Commuter rail service on certain MTA lines has been suspended. A video of one metro north train station shows the snow already covering the rails. With snow still falling and predicted to fall Saturday as well, train service near me has been suspended. 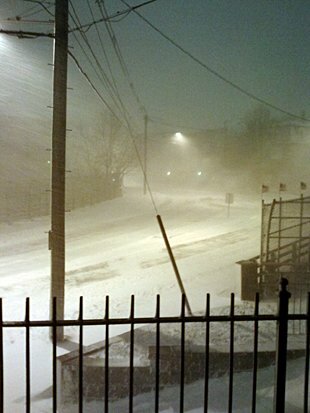 PAWTUCKET, R.I.—This winter storm system is currently hitting the northeast hard. In Rhode Island, we are experiencing wind gusts up to 50 mph. The visibility is very poor and all people have been ordered off the roads. The major highways have been closed to commuters in an effort to keep all non-essential workers off the road. This storm has developed rapidly over the day, starting with a light dusting and light winds to a full-on blizzard. With snow falling at such a fast rate, our area is bracing for more than two feet of accumulation. The snow is wet and heavy, weighing down the trees in my backyard. Shoveling is difficult due to the strong winds and cold chill. With the accumulations, it seems that shoveling needs to be done every hour or so just to keep up. As of 5 p.m., more than 1,000 people were without power. Within the last couple of hours, this number has jumped to tens of thousands. Although we currently are still with power in Pawtucket, the lights continue to dim on and off and we are prepared in the event we do lose electricity. STAMFORD, Conn.—In truth, the snow is indeed still falling and the occasional snowman can be seen (and is being buried ever-deeper), but Winter Storm Nemo, snowpocalypse, Nemogeddon, or whatever it’s being called, has ended its first day with a whimper. Six inches, no match for my Toro Power Max snow-blower, once sat in my driveway, but now grace my lawn in piles; another layer of snow softens their edges. There’s probably an inch or so that has since fallen, which will be handled in the morning. The day was largely uneventful. Nothing distinguishes Nemo from a typical heavy snowstorm. The temperature has been a moderately cold 30 degrees, the wind has not been a significant player, and the snow itself has accumulated, but not greatly and only over 12 hours. NORWICH, Conn.—Connecticut Gov. 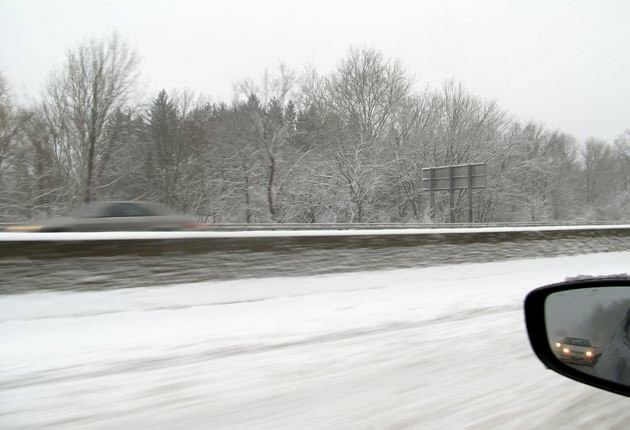 Dan Malloy issued a travel ban for state highways, but local roads are still accessible. 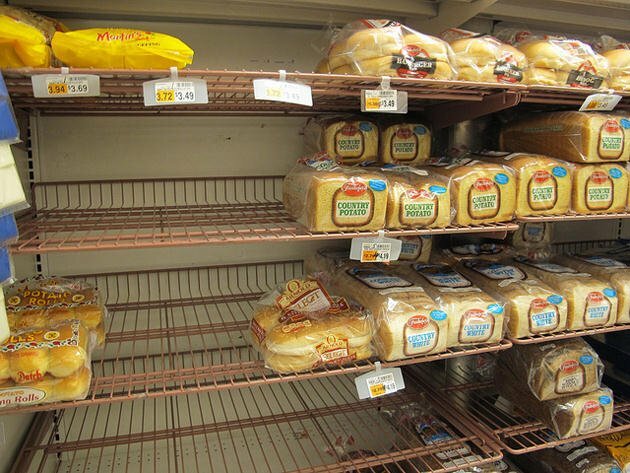 Norwich City Manager Alan Bergren issued a state of emergency for the town as of 4 p.m.
An afternoon trip to our local Stop & Shop found shelves still full with no long lines. The store’s cashiers said they will still be open until midnight tonight. Stop & Shop’s gas station was closed, however, and it was unclear whether it was due to an outage of gas or the snow. Three other gas stations in the Norwich area were still open for business. Roads are still moderately clear with a few snow plows on the road, but it’s become apparent that soon they won’t be able to keep up with the heavy snowfall that we’re currently experiencing. Visibility conditions have also decreased considerably from this morning’s work commute. 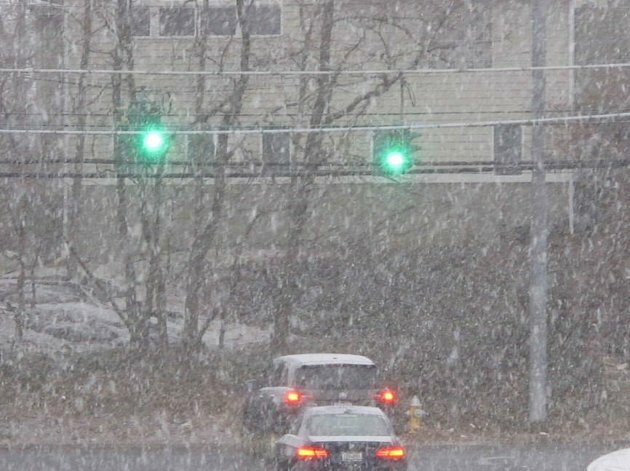 BUCKSPORT, Maine—Snow began falling early morning in mid-coastal Maine. 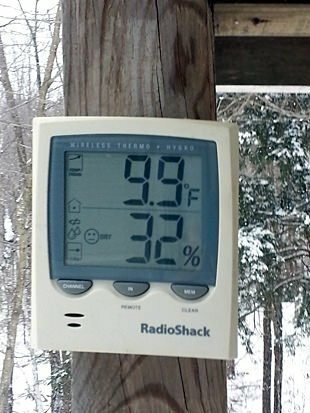 The temperatures were frigid outside and down to around 5 degrees. Winds were whipping, and the roads had just started to disappear with a blanket of about two inches of snow on the ground. Our town’s road crew had its plows on and was already out clearing the roads locally. I am sure these few inches that had begun to fall were an instant reminder that the blizzard was just knocking at our door. We left our house early, so we fared well at the gas pumps with only a few others taking their turn getting gas. We took our gas cans as we would need the gas for the generator if we have power outages. We got enough extra for our snow blower that undoubtedly will get a good workout. We stopped at the grocery store on the way home, so that I could get all the essentials we need, e.g., batteries, water, milk, eggs, coffee, oh—and chocolate! The parking lot was full, and we barely had a place to park—but I got in and out with no major issues with everything I needed to weather the storm. Long Island resident Eric Holden shot this video on Friday afternoon. READFIELD, Maine—The day before a storm of any size, our area grocery stores and gas stations get overrun with customers. Everyone is trying to not only stock up on food and necessities for the possible three days of not wanting to be on the roads, but also collecting water, batteries and something for heat just in case we spend a week or so without power. It is like a game to most of us. We all sit around trying to guess as to how many inches of snow we will end up getting and how many days we will go without power if at all. I personally love the feeling of being surrounded by snow and to be able to sit in my living room and just watch the beauty happen around me. Oh, the work? You want to know about the work side of it? Well, with each storm, there does come a lot of responsibility, but, hey, we are Mainers. We can handle it. Have your shovels handy and your plow on and you will be fine. Make it fun. There is no need to be stressed out. STAMFORD, Conn.—Storm-weary residents here, once bitten by Sandy, are preparing for the worst. Store shelves were empty and lines at gas stations resulted in wait times of as long as 30 minutes Thursday night, as residents prepared to be trapped inside their homes. Water, road salt, and shovels were in short supply. Optimistically, plastic sleds were also sold out. The snow fall is alternating between heavy and light. It seems to fall at inches per hour, only to change to very light flakes. It’s a heavy, wet, sticky snow on the ground, making shoveling a back-breaker. There’s no significant wind to speak of and, thus far, no significant damage, injuries, or power outages reported. The blizzard will continue throughout the day and into Saturday, with the heaviest snowfall expect in the evening. Connecticut’s Gov. Dan Malloy is declaring a state of emergency with road closures to begin at noon. We have adequate supplies of staple foods, gas for the snow-blower, and flashlights and batteries. We checked our property for potential problems and found none (fortunately, no trees are within striking distance of our house). The storm is finding us well-prepared, well-stocked, and ready to spend a weekend indoors. MONROE TOWNSHIP, N.J.—Starting Thursday, residents here began stocking up on food, batteries, snow shovels, and gasoline. Those lucky enough to have generators don’t want to risk running out of gas, which may be as hard to find after this storm as it was after “Superstorm” Sandy. Thousands of flights have been canceled at Newark and other New York-area airports. The parking lot at the local Stop & Shop was jammed, as people stripped shelves of milk, bread, and bottled water. Tempers frayed and a horn-blowing contest erupted over a parking space– if the participants had not been senior citizens, fisticuffs would probably have taken place instead. As of noon, the temperature is hovering around 30 degrees with a steady rain. The rain is expected to change to snow later this afternoon, with an accumulation of six to 12 inches forecast for central Jersey by the time the storm moves out. TILTON, N.H.—Weather conditions are worsening rapidly in central New Hampshire, with highway visibility and road navigation a major problem even in the early a.m. commute. Thick cloud cover at this time just added to the low visibility. The right lane on RT 93 in New Hampshire is relatively clear, as you can see in this video,but passing cars in the left lane make visibility close to zero. I commuted from Tilton to Plymouth, N.H., at 8 a.m., about 30 miles and although the RT 93 was not slick or slippery, drivers who chose to drive below 50 MPH seemed to compound the problem as other vehicles stacked up behind them, and ultimately passed them, creating a potential sliding and collision hazard. The snow spray from the passing vehicles produced complete whiteout conditions for the remaining vehicles when cars and trucks passed us. Franconia Notch is a total whiteout driving situation, as one Thornton driver reported after he turned back from his commute and returned home. 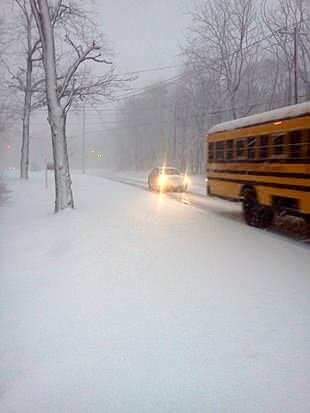 Expect back roads to be even worse than RT 93. Though the plows are out in full force, they cannot keep up with the high rate of snow falling at this time. State troopers can be seen parked along RT 93 and are closely monitoring the situation. Main streets are already sloppy, and I was sliding down hilly side roads, or unable to drive up steep roads. I saw no accidents during this early morning commute, but I am sure that has changed by the time this is published. It was a very tense drive. Staying at home is strongly suggested if at all possible. TORRINGTON, Conn.—I took the day off, as the predicted historic snowstorm approached in Connecticut. I decided to venture out this morning for some breakfast while the roads were still passable. My wife asked me to pick up some donuts while I was out, so I proceeded to the local grocery store where there is a Dunkin’ Donuts. To my dismay there wasn’t a donut left on the shelf. I figured I had to go to the main store where I was sure there would be some since it was only 10 a.m.
As I pulled up to the main Dunkin’ Donuts store, I could see through the window that it was going to be slim pickings. Nothing. Dunkin’ Donuts does not have donuts! I asked the girl behind the counter why a donut shop doesn’t have donuts at 10 a.m. She told me that people were coming in and buying dozens of donuts at a time. Dozens of donuts? Is this some kind of an emergency staple I don’t know about? NEWPORT, R.I.—Here on the coast, we’re preparing for what has the potential to be a storm as severe of the great blizzard of 1978. Almost 35 years ago to the day, that storm left massive amounts of snow on the entire northeastern United States. Grocery stores and supermarkets were bombarded overnight with people preparing for a long freeze-out this weekend. Lines are winding around gas stations here as the storm approaches. A state of emergency was put in to place at noon, so it would be best to stay off the roads unless there is an emergency. The state was prepared for this since last night. Classes were canceled at high schools across the state. All RIPTA buses, including the non-medical ride program, were canceled at noon on Friday in anticipation of the coming storm. People who require public transportation can follow them on Facebook and Twitter at @RIPTA_RI to stay up-to-date with when service will be restored. Residents can sign up for news updates, which will update them of service changes. 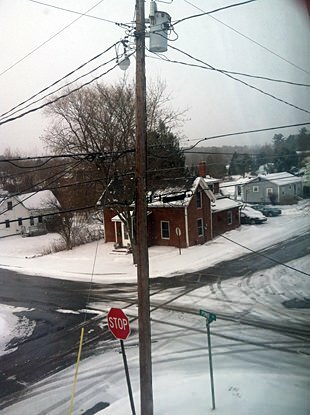 BUCKSPORT, Maine—Somewhere around 7 a.m., it started to flurry fairly hard, and the storm steadily increased its pace. There is already a few inches of snow as of now (1 p.m.), and this is not even the actual storm. That is supposed to hit sometime early this evening and continue into tomorrow. There’s a 19-car pile-up on I-295 in southern Maine, and there have been a number of sirens heard locally in town. If you don’t need to go out, I would suggest not, and if you must, please take it slow and do it soon. From what we are being told, the worst is yet to come. NORTH KINGSTOWN, R.I.—The sky looks grey and menacing. I went to the supermarket Thursday morning (along with at least 100 other people who seemed to have the same idea) and made sure I had enough food. The woman in the checkout line before me said the parking lot was in chaos and everybody was acting like the end of the world was coming. I thought it was very funny, and also very accurate. Now I am warm and safe indoors, and there is nothing to do except wait. There is a feeling of impending doom and my joints ache. I’m not looking forward to this, but I’m as prepared as I can get. I don’t drive due to a medical condition, and ironically I have often found that it is actually faster for me to walk right after a snowstorm, since I can be downtown in 15 minutes. That advantage goes away after the first day or so because they don’t pay much attention to the pedestrians and the priority, understandably, goes to the motorists. People like me are having to deal with ice, slush, and all kinds of yuck. The plows have to dump the snow somewhere, though, and it is usually right where I need to walk. So I have to either find a way around it, or climb over a slippery hill and hope that I don’t fall on my behind, or worse, fall and land in the road in front of a car. I’m also hoping the power won’t go off. Or if it does, that it will only be off for a little while. The heat in this apartment is electric, and it will get really cold in here really fast. Authorities initially believed that there were two gunmen and were searching cars around the school. First grade teacher Kaitlin Roig, 29, locked her 14 students in a classroom bathroom and listened to “tons of shooting” until police came to help. The massacre prompted the town of Newtown to lock down all its schools and draw SWAT teams to the school, authorities said today. President Obama was briefed on the shooting by FBI Director Robert Mueller. It’s unclear how many people have been shot, but 27 people, mostly children, are dead, multiple federal and state sources tell ABC News. That number could rise, officials said. It is the second worst mass shooting in U.S. history, exceeded only by the Virginia Tech shooting in 2007 when 32 were killed before the shooter turned the gun on himself. Today’s carnage exceeds the 1999 Columbine High School shooting in which 13 died and 24 were injured. Today’s shooting occurred at the Sandy Hook Elementary School, which includes 450 students in grades K-4. The town is located about 12 miles east of Danbury. Vance said that on-duty and off-duty officers swarmed to the school and quickly checked “every door, every crack, every crevice” in the building looking for the gunman and evacuating children. Three patients have been taken to Danbury Hospital, which is also on lockdown, according to the hospital’s Facebook page. Newtown Public School District secretary of superintendent Kathy June said in a statement that the district’s schools were locked down because of the report of a shooting. “The district is taking preventive measures by putting all schools in lockdown until we ensure the safety of all students and staff,” she said. State police sent SWAT team units to Newtown. “We have increased our police presence at all Danbury Public Schools due to the events in Newtown. Pray for the victims,” Newtown Mayor Boughton tweeted. State emergency management officials said ambulances and other units were also en route and staging near the school. MIAMI (Reuters) – Hurricane Sandy, a late-season Atlantic cyclone that threatens to be one of the worst storms to hit the Northeast in decades, slogged slowly northward on Friday after killing at least 41 people in the Caribbean. Forecasters said wind damage, widespread and extended power outages and coastal and inland flooding were anticipated across a broad swath of the densely populated U.S. East Coast when Sandy comes ashore early next week. “We’re expecting a large, large storm. The circulation of this storm as it approaches the coast could cover about the eastern third of the United States,” said Louis Uccellini, director of the National Oceanic and Atmospheric Administration’s Centers for Environmental Prediction. He stopped short of calling Sandy possibly the worst storm to hit the U.S. Northeast in 100 years, as some weather watchers were doing, but said Sandy was shaping up to go down as a storm of “historic” proportions. On its current projected track, government forecasters said, Sandy could make landfall on Monday night or Tuesday in Maryland, Delaware, New Jersey, New York or southern New England. Coming in the final weeks before the U.S. presidential election on November 6, the storm could throw last-minute campaign travel plans into chaos. An aide to Republican presidential challenger Mitt Romney said he had canceled a campaign event scheduled for Sunday night in Virginia Beach, Virginia. President Barack Obama’s re-election campaign announced that Vice President Joe Biden had also canceled a trip to Virginia Beach scheduled for Saturday. The Democratic incumbent was traveling to New Hampshire on Saturday, and on Monday was due to visit Youngstown, Ohio, and Orlando, Florida. Craig Fugate, director of the Federal Emergency Management Agency, said he and the head of the U.S. National Hurricane Center had briefed the president on preparations for the storm on Friday morning. “His direction to us again, as always, is to make sure we are prepared to support the states and the governors dependent upon the impacts of the storm,” Fugate told reporters. Some further weakening was forecast over the next two days, but the Miami-based National Hurricane Center said hurricane- or tropical-force winds were still likely by the time Sandy hits the U.S. coast. 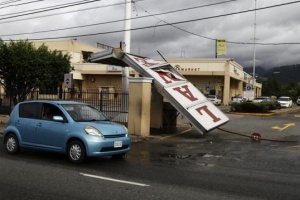 Sandy’s driving rains and heavy winds were blamed for 41 deaths in the Caribbean, where landslides and flash floods were triggered by the cyclone. The Cuban government said Sandy killed 11 people when it tore across the island on Thursday. The storm took at least 26 other lives in deeply impoverished Haiti and four people were killed in the Dominican Republic, Jamaica and the Bahamas. The Cuban fatalities were unusual for the communist-ruled country that has long prided itself on protecting its people from storms by ordering mass evacuations. The National Hurricane Center said Sandy was about 420 miles south-southeast of Charleston, South Carolina, late on Friday afternoon, packing top sustained winds of 75 miles per hour (120 km per hour). Sandy was forecast to remain a Category 1 hurricane as it completed it passage over the Bahamas late on Friday, sending swirling rains and winds across areas including Florida. It was moving slowly, however, making its final trek across the central and northwest corner of the Bahamas islands at 7 mph. Many forecasters are warning that Sandy could be more destructive than last year’s Hurricane Irene, which caused billions of dollars in damage as it battered the U.S. Northeast. Uccellini said he was reluctant to make comparisons with other storms. But he warned that a full moon on Sunday added to Sandy’s potential for destruction when it comes ashore in the United States. Todd Kimberlain said Sandy was somewhat unique because of its integration with the polar trough over the United States. 1 of 9. Heavy rains from Hurricane Sandy causes the Croix de Mission river to swell to levels that threaten to flood the homes along its bank in Port-au-Prince October 25, 2012. East Coast residents are preparing for Hurricane Sandy’s arrival as forecasters expect a “perfect storm” of three different systems that will slam the region early next week. New York City and northern regions in the eastern corridor are likely to be hit hard and forecasters are warning that the storm may linger for days as it covers a massive area. There is a 90 percent chance that on Monday the East Coast will take a direct hit, forecasters say. As of 5 a.m., Hurricane Sandy was approximately 300 miles east of Miami and moving northwest at 13 mph. Florida is expected to see stormy conditions today, with 1-4 inches of rain in some areas. Waves up to 15 feet along the coast are expected, as is a storm surge 1-2 feet along the Florida eastern coat. Warnings are in effect along Florida’s east coast from Ocean Reef to Flagler Beach. Storm watches are in effect on Florida’s east coast from Flagler to Fernandina Beach and from the Savannah River north to Oregon Inlet, N.C., including Pamlico Sound. By Saturday afternoon, Sandy is expected to increase its forward speed and become a hybrid storm, pushing a lot of rain into the Carolinas and southern Mid-Atlantic region, with some areas getting more than a half a foot of rain through Sunday. Sandy’s landfall is predicted to be somewhere in southern New Jersey on Tuesday around 8 a.m. 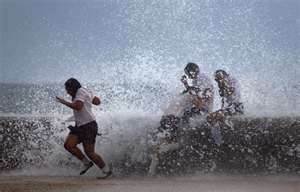 Forecasters told The Associated Press that the storm could linger in the atmosphere over the same locations for five or six days, and that is could bring six inches of rain, 80 mph wind gusts, 20- to 30-foot-high seas and extreme coastal flooding. The entire system will weaken by the end of next week as is sits over the northeast, but strong winds and rain will remain across the region through next Friday. [TRANS] 120918 SM vs JYJ, Negotiations Break Down Once More… Will The Lawsuit Be Extended Yet Again? SM Entertainment and JYJ (Kim Jaejoong, Kim Junsu, Park Yoochun) have once again failed to reach an agreement as they battle over TVXQ’s exclusive contract. An arbitration session for JYJ’s exclusive contract lawsuit was held at the Seoul District Courts at 5pm on the 18th of September in room 579. This session had been scheduled by the judge’s orders though the final verdict had been scheduled to be made on the 13th. So that the two sides could end the dispute with an agreement, the judge called in SM Entertainment’s CEO Kim Young Min and each side’s lawyers for an arbitration session that lasted around an hour. However, it ended in failure with both sides doing nothing but reaffirm the differences in their positions. It is said that the judging panel urged the two sides to come to an agreement during the session. The next court date has not been set, and the verdict has been postponed indefinitely. The reasoning was to give the two sides enough time to discuss and settle the dispute. This has made it almost impossible to determine when this lawsuit, which began three years ago in 2009, will finally come to an end. 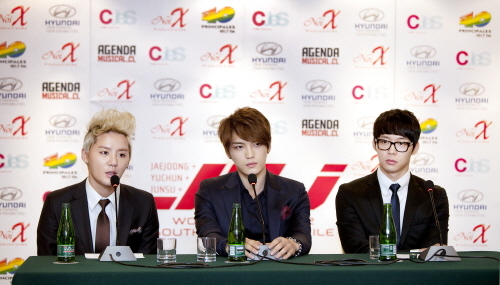 SM Entertainment and JYJ’s lawyers have met several times since May, 2011 to come to an agreement and settle the issue. However, the final arbitration session of 2011 ended in failure, causing the case to be brought back to court. Though both sides gave their final pleas in May of this year, a clear difference in their stances could be seen. A final verdict was to be made this month but another arbitration session was held as the courts wish for both sides to end this dispute in an agreement. Chris Stevens, the U.S. ambassador to Libya killed along with three others in a rocket attack outside the American Consulate in Benghazi—ignited by protesters angry over a film they say insults Prophet Muhammad—was “a courageous and exemplary representative of the United States,” President Barack Obama said in his initial statement Wednesday condemning the attack. Initial reports said the slain embassy staffers—who also include foreign service information management officer Sean Smith—were trying to flee the consulate building when they were fired upon. According to the Associated Press, a Libyan doctor who treated Stevens said the diplomat died of severe asphyxiation from smoke inhalation and that he tried for 90 minutes to revive him. Stevens, 52, was the first U.S. ambassador killed in the line of duty since 1979, when Adolph Dubs, U.S. ambassador to Afghanistan, was gunned down in a kidnapping attempt. In response to the attack, the United States is “deploying elite Marine counterterrorism teams to Libya,” Foreign Policy reports. The Pentagon is sending Fleet Anti-Terrorism Teams, or FAST teams, a U.S. defense official told the magazine. Hurricane Isaac is expected to hit over southeastern Louisiana, possibly the New Orleans area, sometime Tuesday night or early Wednesday and is gaining steam with sustained winds swirling at 75 mph. The center of the storm that was about 75 miles from the mouth of Mississippi River at midday. 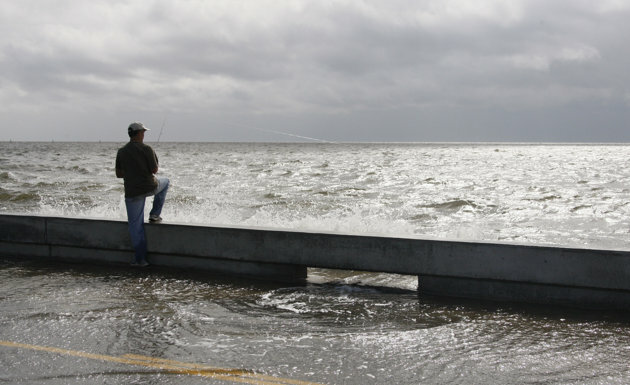 Landfall would come during the seventh anniversary Hurricane Katrina that devastated the area. Isaac is expected to maintain hurricane strength, making it the first to hit the Gulf Coast since Ike in 2008. As of Tuesday morning, the U.S. National Hurricane Center predicted Isaac would maintain at least Category 1 strength. Winds would be at least 75 mph and can be as high as 95 mph. Southeastern Louisiana is in its crosshairs, but the track could still veer farther west, or to the east in Mississippi. Regardless of where it hits, Isaac’s reach is large and it will dump heavy rain as far east as Florida. While people across the coast were boarding up their homes to prepare for damaging winds, the even bigger fear is potential flooding. Isaac could push storm surge as high as 12 feet into parts of Louisiana and Mississippi, and 1 to 3 feet high as far away as Florida’s west coast. Around New Orleans, residents hunkered down behind levees fortified after Katrina. Isaac already left a trail of destruction in the Caribbean, most of it blamed on flooding that killed 24 people. Isaac veered well west of the Republican National Convention site in Tampa, but it was soggy over the weekend in the bayside city. The GOP pushed back the start of speeches a day to Tuesday and protesters’ ranks have been small, in part because of the soaking brought on by Isaac and in part because of the huge police presence in the city. The coming storm has also altered some Republican governors’ plans to attend. Florida Gov. Rick Scott canceled a speaking engagement, and Louisiana Gov. Bobby Jindal and Alabama Gov. Robert Bentley canceled their trips to Tampa. Officials in Louisiana’s St. Charles Parish near New Orleans and Terrebonne Parish that includes Houma closer to the Gulf have told about 73,000 residents total to leave ahead of the storm. Some coastal residents in Alabama have also been told to evacuate. However, officials haven’t ordered the kind of evacuations that have in the past clogged interstates, with both sides of the highway heading one direction. In New Orleans, Mayor Mitch Landrieu said evacuations would not be ordered and told residents to prepare carefully and ride it out. 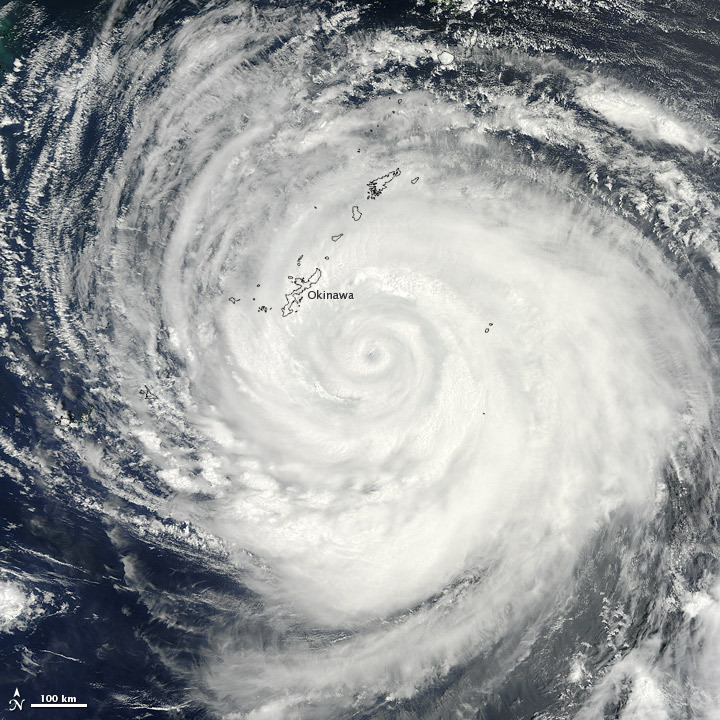 On August 26, 2012, Typhoon Bolaven passed over Japan’s Ryukyu Islands, the eye of the storm making landfall on Okinawa. The Moderate Resolution Imaging Spectroradiometer (MODIS) on NASA’s Terra satellite captured this natural-color image when Bolaven’s eye was situated southeast of the island. CNN reported that Bolaven was the strongest typhoon to strike Okinawa in nearly 50 years, with winds of 259 kilometers (161 miles) per hour. Along with high winds, Bolaven’s heavy rainfall and storm surges were expected to pose hazards for island residents. The island’s infrastructure, however, is built largely out of solid concrete and able to survive strong storms. Unisys Weather reported that, on August 26, Bolaven was a Category 4 typhoon with winds of 115 knots (215 kilometers per hour). The storm had weakened by August 27, when the U.S. Navy’s Joint Typhoon Warning Center (JTWC) reported that the storm had maximum sustained winds of 70 knots (130 kilometers per hour). It nevertheless remained a strong storm, and the JTWC projected storm track showed Bolaven passing over the Yellow Sea and the Korean Peninsula over the next two days. On August 27, 2012, MODIS acquired another image, showing both Bolaven and Tembin off the east coast of China. CNN. (2012, August 26) Massive Typhoon Bolaven slams Okinawa, heads for Koreas. Accessed August 27, 2012. Joint Typhoon Warning Center. (2012, August 27) Typhoon 16W (Bolaven) Warning. [Online] URL: http://www.usno.navy.mil/NOOC/nmfc-ph/RSS/jtwc/warnings/wp1612web.txt. Accessed August 27, 2012. Unisys Weather. (2012, August 27) Bolaven Tracking Information. Accessed August 27, 2012. NASA image courtesy Jeff Schmaltz, LANCE MODIS Rapid Response Team at NASA GSFC. Caption by Michon Scott.